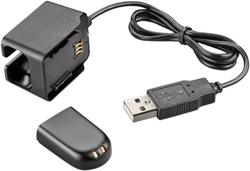 USB Deluxe Charging Kit for Savi W740 / W440 lets you charge your Replacement Battery. When you add a Savi USB Deluxe Charging Kit to your Savi W740 or W440 (only compatible models) you can charge batteries while you talk to avoid interruptions to your important telephone calls. The Savi USB Deluxe Charging Kit can be purchased for your Savi W740 and W440 headset. It comes complete with a custom USB charger and replacement battery. The USB charger can charge your spare battery while you use your W740 or W440 Savi headset. Savi **USB Deluxe Charging Kit with Replacement Battery offers unlimited talk time! ** Unlimited talk time with USB deluxe charger and spare battery. Only available as an accessory for the Savi W740 and Savi W440.